February 14th is coming soon to a speech room near you! 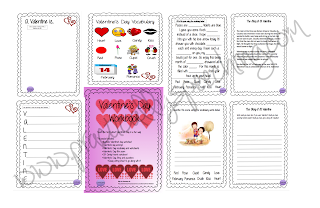 In preparation, I created this all-in-one packet for you to use! It's great, a printable PDF chock-full of V-day activities! Plus, only the front cover is pink so your boy students won't be gagging too much! haha The story of St. Valentine is included in this packet, which I found pretty interesting. Who knew V-day was more than just a hallmark holiday?? Interesting stuff! Download this packet, your students will love you for it! Click HERE.